First, a technical note: We had some under-the-hood WordPress problems with the website starting the second week of January that kept me from being able to write or edit the blog. Just about the same time, our web designer was taken ill and out of the office for the past few weeks, so I didn’t have the tech support to find out what the problem was or know how to fix it. Fortunately, while she’s not back at work yet, we’re delighted to hear she is recovering well. So earlier this week, I was lucky to find another WordPress expert who dropped what she was doing to dive into our site and diagnose the problem. It was, of course, a WordPress update on January 11 that was incompatible with the WordPress theme (or template design) we had used for the website. Apparently we weren’t alone. The only fix was to get a new theme, which we did yesterday, and 24 hours later, our new expert has us back online. We hope you like the new look. We are still tweaking things, so we’re not 100% yet, but the basics are in place. So here’s a new blog post! The photo above is Darla, sprinting across the snowy front yard from the spruce at the other end all the way to the house. She is, as I’ve mentioned before, the ultimate snow-bunny. She loves this kind of weather. She will grab mouthfuls of snow on the way out the door in the morning, and she’ll go running and jumping as she heads out into a fresh overnight snowfall. When you watch her racing like this, it’s hard to believe she’s had five cancer surgeries, cataract surgery, a spleen removal and a knee replacement. She’s often just playing in the snow by herself, bucking and kicking like a rambunctious colt. The other dogs have no idea why she likes the cold and snow. She may be from northern Michigan originally, but still…! They’re buried under blankets in the living room and would prefer not to be seen again until April, while Darla can’t wait for the temperatures to plummet and the snow to fall. Now if only I could train her to use the tractor to plow. Great to see the new look and the new blog. I’m, sure everyone was wondering what was happening. Darla sure does look happy out there running in the snow. I see you haven’t any weather warm enough to melt that snow yet. All the better for Darla, I guess. That’s a great photo! I have a dog who hates the cold, but loves to eat snow. She’ll stand there, shivering, picking out the more compacted bits and chewing away. I guess she has her priorities. Good to have you back! I thought you had a new dog with stand up ears! 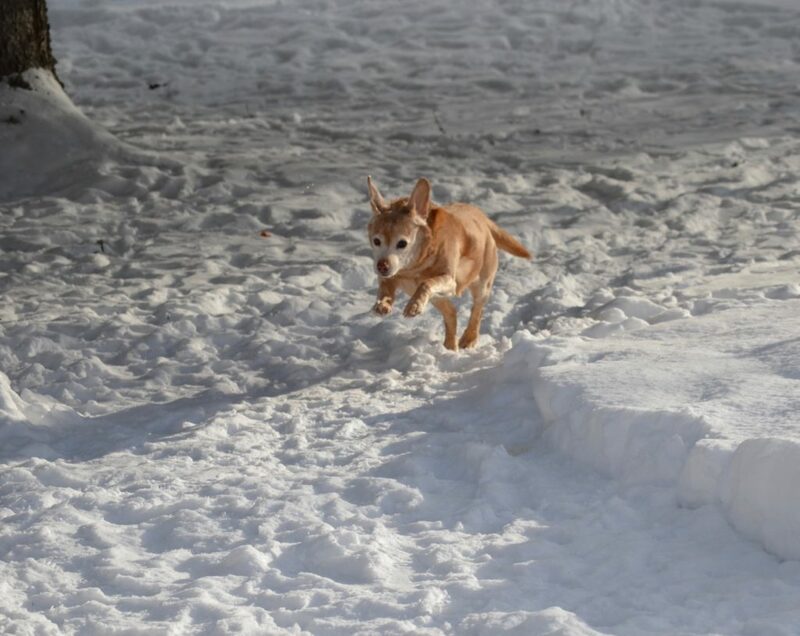 That’s my dog too, loves loves loves running in the snow! Glad to see her doing so well and glad you’re all ok! Have a great weekend! I was so happy to see a new post on the blog. I started to worry that something had happened to one of the dogs and it made me nervous. Very glad it turned out to be a technical glitch and nothing more. Love the picture of Darla. I’ve been wondering where y’all were. Glad to hear it was only a blog issue. Get weekly wisges to your regular WordPress helper. I love this picture. Daria is such a doll. I pictured her playing in the snow. What fun!!! So glad you’re in our New Year! Thank you for all you do for the animals who, in turn, do for us — unconditional love. Isn’t Darla the dog that has convinced you the upstairs guest bed is hers? She sure looks different in this photo than lounging about. But she’s going to need that cozy spot when she comes in from the cold. Hope her humans have her bed ready! Also, if I’m using Mozilla, and take too much time typing my comment, The Captcha function gives me an error and says “Captcha time expired.” Those things are so deep into the programing that they often can’t be fixed. But I thought I might take the opportunity to mention it. I just switch to internet explorer to post my comment. I also have the captcha time out on me all the time by the I type my reply. It feels like it’s set to 60 seconds. I always have to copy my reply and refresh the page and paste it back in. An extra minute would help if that’s at all possible. Barb and Diane, sorry about the captcha time-out on comments — I didn’t know it was a problem. It had been set at 5 minutes but we’ve re-set it for 10 minutes. If that isn’t sufficient, just let me know and we’ll keep increasing it. It’s a shame we even have to have something like this on comments, but way back when we started getting flooded with spam comments. The new look is great. Sorry you had to struggle with technical problems; they are never fun. Darla is looking quite sprightly considering her medical issues. Glad to hear she’s doing well. Better yet, love the picture of a happy dog. With all her trials, Darla is in her element and happy. Brings warmth to the soul. Glad to see you are up and running again. Your blog posts were very missed. I wouldn’t have guessed this was her unless you said so. He warms my heart to see her enjoying the snow. She’s certainly living a quality life. Way to go Miss Darla! Love the new site; love the photo of this crazy dog who keeps outliving the odds. So happy she is out there enjoying life! Thanks for extending the timing, as I kept getting timed out as well.